For entry pages I’m planning on putting the tombstone information at the bottom facing the large recto images. The chat retains the decorative initial (from the Poetica font set; the main text is a form of Garamond). Does this look okay? Here are the underlying page guides. The magenta area is the main text block — a four column block, although I may only use two columns for text. The cover would use the same page design elements. Here’s a closer view of the type treatment. Again, this is all a little preliminary, but it reflects my plans at this stage. I am trying, of course, to match the design to the content. You may be able to see from the first couple of spreads the sort of proportions that are typical of Persian ceramics. If anyone has any suggestions I would be happy to hear them. Very nice. I can’t help seeing an L in that P, though. Gorgeous! I don’t know if I’d use Garamond though; maybe it’s just me but I think that Garamond is a wee bit too fussy to pair against the Persian ceramics. However, I am sure that whatever you do will be exquisite and a tribute to the collection at the Asian. Seeing beautiful art in a museum does not usually bring out my collectors lust but I did find myself thinking that if I would just slip that plate into my purse…….ahem. Obviously I fought the impulse because I’m an honest woman but the ceramics at the Asian in general are simply magnificent. I don’t know about the two-column, ragged right, narrow alley that you show above for your Persian ceramics book above. The rag distracts and—at least in my estimation—violates my one, real rule: Don’t let Style take the reader away from the book’s Substance. 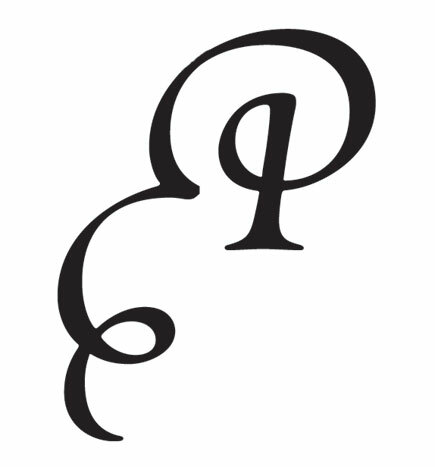 I also agree with seeing the L in the P. I don’t think Garamond–which Garamond, by the way?–is a problem, as it’s kind of a classic face. But something a little less sharp, and yet as much or more of a classic (depending on whose Garamond you were going o use; some, of course, not having anything to do with Claude Garamond’s designs) wiuld be Goudy Old Style. Thanks, everyone, for your comments. The P doesn’t bother me that much, but several people (not just here) have said it looks like an el. It’s out of the box from the Adobe Poetica fontset. The flourishes are an element on all of the pages. I could modify the P to look something like this, to avoid confusion with an el. As for Garamond, I’m not actually a huge fan of it and don’t use it that much, but it seems to me to work with the Persian material and the Poetica initials. There are, of course, many fonts that make claim to being “Garamond,” as well as many that really are forms of Garamond but under other names; and then there are two or three different styles of “Garamond.” I just ignored all this as too complicated to get into. The typeface I am using is Garamond Premier Pro, designed by Robert Slimbach based on type in the Plantin museum in Antwerp (BTW, I thought I had posted on the Plantin museum, which I visited a couple of years ago, but I guess I just imagined it!). This version has quite an extensive number of glyphs and is certainly the best of its type I have used to date. I think rag is easier to read than justified, not harder. I can’t use justified columns with this design as it is now because the space between the columns is too narrow. Today is Monday, April 22, 2019 4:46 am (U.S. central time).